The project described here creates a website hosted on the Phidget Single Board Computer (SBC). The website can both serve static pages, as well as pages that can send simple requests back and forth to the Phidgets attached to the SBC. With this kind of system, you only need to develop cross-browser compatible web pages, as the code to control the Phidget runs on the SBC. As with any of our described projects, Phidgets takes care of the electrical component design. This is a middle-ground solution to controlling Phidgets over a network using the SBC. If you just want data to go back and forth between Phidgets and your computer - via the SBC - over the network, you probably want the simple example in the Use Phidgets Wirelessly with the SBC guide. If you want something more powerful and flexible than the CGI in this guide to control Phidgets over a network, you may be interested in the full Web Server on the SBC guide coming soon. Worked through the 1072 User Guide or 1073 User Guide page to have set up the network on your SBC and obtained its IP or local link address. The SBC already runs a web server, with the pages to be served located in the /var/www directory. We take advantage of this by creating a web page using a cgi-bin Python script. 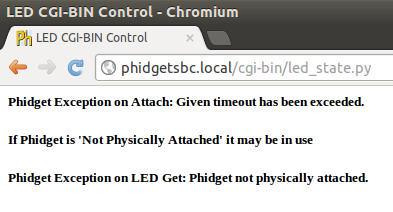 Since the script is in Python, it can also control any attached Phidgets, including the Interface Kit on the SBC. First, we build a static web page with no Phidget involvement. If you just want to host a few pages on the SBC, that part of the example will help greatly. Then we write a separate and unrelated Python script, save it in the SBC's cgi-bin directory, and run it over the network. To create a web page hosted on the SBC, you simply have to create one and save it in the /var/www/ directory. Script-generated web pages go in a special folder called cgi-bin/ within the /var/www/ directory. In addition, they end with an extension that tells the SBC how to run them. Python cgi scripts end with .py. errors = errors + "<h5>Runtime Exception on object creation: " + e.details + "</h5>\n"
errors = errors + "<h5>Phidget Exception on Open: " + e.details + "</h5>\n"
errors = errors + "<h5>Phidget Exception on Attach: " + e.details + "</h5>\n"
errors = errors + "<h5>If Phidget is 'Not Physically Attached' it may be in use</h5>\n"
errors = errors + "<h5>Phidget Exception on LED Set: " + e.details + "</h5>\n"
errors = errors + "<h5>Phidget Exception on LED Get: " + e.details + "</h5>\n"
Save it, and your SBC is now ready to control the LED over the web! Head over to the web address of your Python cgi script: http://phidgetsbc.local/cgi-bin/led_state.py - replacing the local link address and file name if you've changed them. You will arrive (depending on the initial LED state) at one of a few different pages. Then there are two pages where we include a request for a new LED state in the http address. You can do this by tacking a ?setLED=0 or ?setLED=1 on to the end of the address. The Toggle LED link is just generated in the Python script to be a request-type page with the request toggling the LED. And you're done! Give the web page address to everyone on your local network, so they can have fun turning your LED on and off at random times. How would you create a mutual exclusion setup to prevent this from happening on the web? How would you create a different setup to prevent this from happening with other programs?